Volunteers Need to Build Our Playground – October 26 through Oct 29! We are super excited to for our new playground and we are looking for volunteers for a community build for which volunteers are critical! The Parent Advisory Committee (PAC) will need to scale back or cancel this event if we don’t get enough volunteers so please register ASAP. The playground build requires many volunteers, but no special knowledge or equipment, although wheelbarrows, shovels, and rakes are welcomed. Volunteers are needed throughout the day from Friday-Sunday. Please click here for more details. Please sign up for a volunteer spot (or two!) to help with the playground build ASAP. 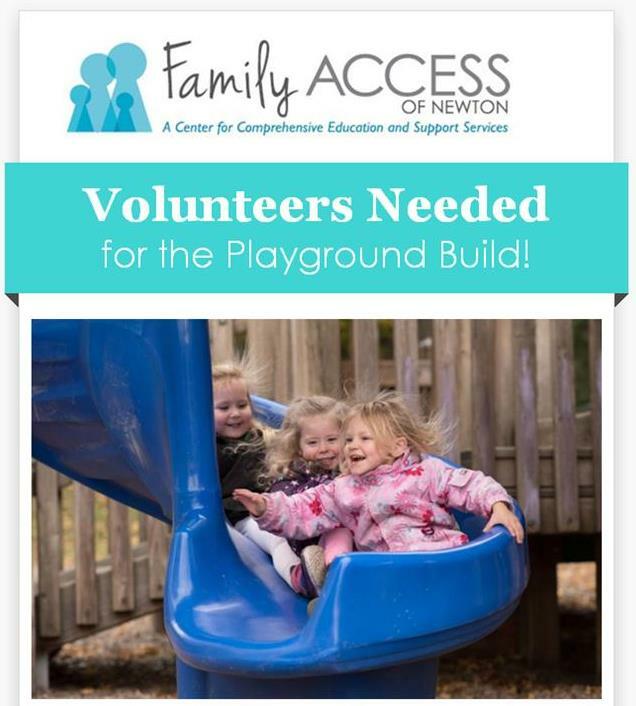 Family ACCESS is getting new playgrounds and we need your help to build them! What: Community Build of two new playgrounds (ages 6 months-5 years). When: Thursday through Sunday, October 26th, 27th, 28th & 29th, 2017 (10/29 is as needed to finish). Why: A community build lowers installation costs considerably, leaving more money to spend on play equipment. Do I need any particular construction skills? No! If you can read and follow directions, we can use you! Volunteers will be guided and supervised by playground construction professionals. How many volunteers do you need and what will we be doing? Do I have to volunteer for the whole day? No. Volunteers are asked to commit to at least a two-hour block – you can sign up for as many blocks as you like. How old do I have to be to volunteer? In order to keep the work site safe, we ask that volunteers be at least 16 years old. You are welcome to bring children, however you must arrange for them to be supervised by someone away from the building activity. Unfortunately, we can’t provide child care. You don’t have to bring anything, but the following items would be helpful if you have them. *Please label all tools. Yes! We will be providing breakfast, lunch and snacks on Friday and Saturday. The community build will happen rain or shine. If the weather is particularly bad, we may have to postpone work until Sunday. When will the children be able to play on the new playgrounds? The preschool playground should be ready to go on Monday, October 30th. The infant-toddler space will take a little longer to finish as we have to wait for the new rubber surfacing to be poured and set. Thank you in advance for being part of this awesome project!